What did you think of Max Payne? There’s certainly been worse video game turned movie films in recent years, and this one certainly isn’t the best. The last little bit, the “real” action scenes, are entertaining, and have some decent CGI, but don’t redeem the previous hour plus of wasted time. The acting is… pathetic. I guess that’s the right word. Didn’t Mark Wahlberg used to be a good actor? I know Ludacris (Chris Bridges) was certainly much better in Crash than he was in this. Mila Kunis was much better in Forgetting Sarah Marshall, and was pretty much wasted as a “cast member” on this film. I’ve never played the video game, but based on what I’ve read since watching this movie earlier, the movie’s nothing like it. 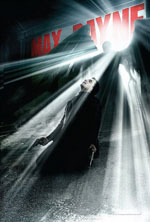 Diehard Max Payne fans are in uproars over the movie, and are boycotting the DVD release next month. While I didn’t like it, I didn’t hate it that badly. There’s certainly better ways to spend your time and money, there’s no doubt about that. Given the opportunity, I wouldn’t give Max Payne a second viewing, and wouldn’t recommend you give it a first, if you haven’t seen it yet.